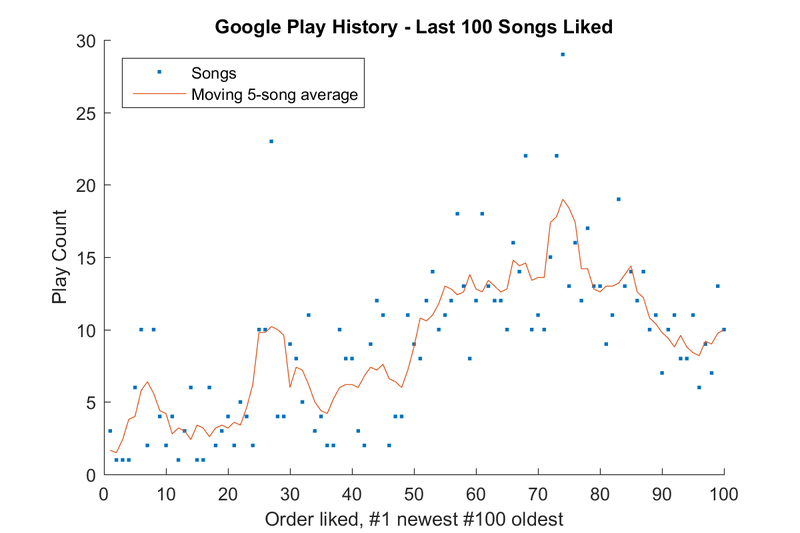 I keep a rolling playlist of my last 100 liked songs on Google Music, which also records how many plays each song gets. I update it about once every two weeks, and songs tend to last two months before getting pushed off the bottom. Here are a couple graphs of what my current playlist looks like, click the arrows to switch back and forth. 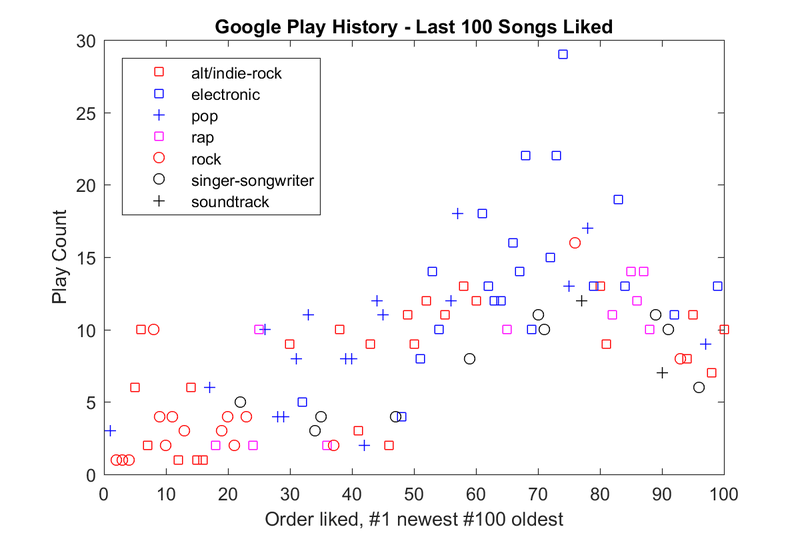 Both graphs show the order liked on the x-axis (more recent is to the left) and the play count on the y-axis (higher is more plays). First graph is just the raw data with a 5-song moving average, and the second breaks them out by genre. This told me a couple things I thought were interesting. First, having liked a song for longer doesn’t mean I’ve listened to it more often. I shuffle my library pretty often, so I thought I’d see a pretty linear rise in play count based on how long ago I liked them. You can pretty clearly see I listened to a lot of the same songs around the 60-80 mark, which would have been about a month and a half ago. Besides the Bleachers song, four of the five are EDM. I also liked these songs near each other, that peak in the middle around 60-80 songs includes all these tracks, meaning I probably listened to them all at the same time pretty frequently. There was a “rising tide lifts all boats” effect going on here. Songs of other genres that I liked around the same time as the top played also top their respective categories, I liked Marry Song – Band of Horses right after Closer by the Chainsmokers, and it’s my most listened to track outside of EDM/pop. Don’t get me wrong I love the song, but if it wasn’t right next to my other most played song I doubt it would have gotten so many plays. That’s it for this time, I want to do the same analysis when the most recent liked song Sit Still Look Pretty (Daya) gets pushed off the bottom. So what soundtracks are you listening to. Hello Dolly? The Music Man? There were lots of pluses up there! Ha, it’s kind of hard to tell but only the black crosses were soundtrack songs, the blue crosses are pop. I should differentiate those more. The two tracks are Your Hand in Mine (Explosions in the Sky) – Friday Night Lights and Lux Aeterna – Requiem for a Dream.